I’ve recently finished another E-design for a client who is having a little girl. This one was so fun for me because my client already has two little boys, so I knew this room needed to be all bits of feminine! At the same time though she didn’t want a pink room. I am not the “pink room” designer anyway. 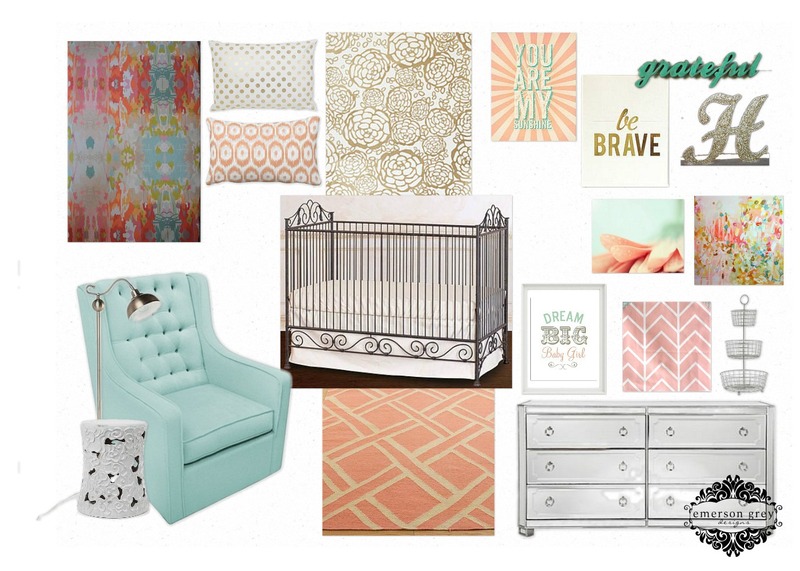 I love the ways you can make a room girly and whimsical without having pink walls. Here is the design board. Out of respect for my paying clients I do not share sources of all the items used in their designs. Please contact me with any questions. We are having an accent wall of Hygge & West Petal pusher wallpaper in gold and white. A mirrored dresser and aqua velvet chair. A beautiful watercolor crib sheet by Candy Kirby Designs is the main piece tying in all our colors. Her existing Bratt Decor wrought iron crib in slate will offset this sheet perfectly. Touches of glitter and gold throughout will make the room shine. I’m so excited to see this room come together. Love this nursery design! I was wondering if the coral/cream swatch at the bottom next to the dresser was a rug and, if so, where I can find it. It would be perfect for my current design project. Any info would be greatly appreciated. Where is the coral pillow from?